Internationally renowned sound artist Richard Chartiere brings together a celebrated group of international artists for a thought-provoking new media exhibit which explores the connection between the viewer and the flow and transfer of data at Artisphere from Thursday, September 22 –Sunday, November 27, 2011. These selected and commissioned works by Caleb Coppock (U.S.), Mark Fell (U.K.), Andy Graydon (U.S./Germany), Ryoji Ikeda (Japan), France Jobin (Canada) act as hubs of sensory information-sites of signal, noise, presence, and absence. Data/Fields marks the artists’ gallery debut in the Washington, DC-area and includes two premiere exhibitions in the United States. The exhibit is a part of Artisphere’s ongoing commitment to present a forum for innovative new media that encourages visitors to discover and experience art through sensory touch, sound, and feel. The show will open with a free reception on Friday, September 23 from 7-10pm in Artisphere’s Terrace Gallery. Curator Chartier and Artisphere Visual Arts Curator Cynthia Connolly will lead a free gallery talk on Data/Fields on Monday, September 26 at 12:30pm. CALEB COPPOCK (b. 1977) works in a variety of mediums including sound, installation, painting, sculpture, and video and has exhibited his artwork throughout the U.S. and internationally. Much of his work explores subtle potential embedded in both digital and natural processes. Coppock earned a BFA in sculpture and new media from the Minneapolis College of Art and Design in 2007. His work has been exhibited nationally and internationally including Open Source at raum500 in Munich, Germany; Litter Compositions at SLOT in Lubiaz, Poland; Summer Invitational IV at Thomas Barry Fine Arts in Minneapolis, Minnesota; and his first solo show Soft Rot (remix) at the Bemis Underground in Omaha, Nebraska. This is the first showing of Coppock’s work in the DC area. Data/Fields features Coppock’s Graphite Sequencer which leverages graphite’s electrical conductivity, converting it into sound by joining the surface of a drawing with the circuitry of a simple tone generator. The project enables a tactile participation in sound production. A drawing on paper becomes a hand-rendered interface for creating sound. The circular compositions contain electrical and visual information, forming a rotating field of data. Over time, a lexicon of drawing techniques develops, producing both direct, correlated results and surprising glitches. The graphite speaks an invisible language as drawn lines are translated from their original, hand-made origins. In this work, the viewer/listener can make the direct correlation between action/connection and sound. Line and form become a language of the electrical transposed from its original human gesture/expression. The drawing and drawer and listener become part of the same circuit. MARK FELL (b. 1966) is a musician and artist based in Sheffield, England. For the past decade, Fell has been one of the leading innovators in the fields of experimental electronic music and sound art, exploring the relationships between geometry, color and waveform. His work has been performed and exhibited internationally to wide critical acclaim. Fell is one half of electronic music duo SND. He earned solo acclaim with the release of two albums Multistability (Raster Noton) and UL8 (Editions Mego) in 2010. This is the first gallery exhibition of Fell’s installation work in the U.S.
His installation in Data/Fields, Tone Pattern Transactuality is the newest computer generated sound and image piece in a series of works by Fell entitled Attack on Silence. The series uses intense color and sonic forms that are direct outcomes of the same elementary mathematical process. Fell is influenced by the visual and sonic structures present in both sacred geometries and technological interventions in mind control. 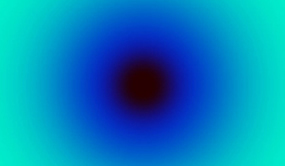 Through the early stages of the series, Fell’s central concern was to examine and aestheticize such structures using computational methods. However, as the series developed, Fell’s concerns have shifted away from the sonic and visual forms found in mystical and scientific practices, to explorations of change and attention, and the interplay between psycho-neural and technological process. These later works feature a constant radial form whose boundary blurs into its background with spectral change of varying magnitude and duration. The central ambiguity of the work-the temporal and spatial condition of the object-foregrounds the percipient’s ‘internal’ process. In asserting the impossibility of a ‘passive’ perceptual state the viewer is prompted to consider if the perceived form-its shifting color fields, and transitional status-exist on the screen or retina, or ultimate synthesis. ANDY GRAYDON (b.1971) is an artist and filmmaker based in Berlin. Graydon’s current work focuses on the interaction of media and environment has been influenced by growing up in Maui, Hawaii and his background as a filmmaker. Taking the form of projected light and video installations, photographs, sound works, and architectural interventions that are attuned to site and context, Graydon’s work explores the interplay of phenomenal, ecological, and social constructions that make up our composite notion of place. Exhibitions include Unmonumental, The New Museum, New York; You Are Free, Kunsthalle Exnergasse, Vienna; Untitled (plate tectonics), Program, Berlin; Room Works, Portland Art Center, Oregon; and Untitled (fault), Marian Spore, New York. Graydon has released sound works on numerous labels, including Nonvisual Objects (Vienna), mAtter (Tokyo), Winds Measure Recordings (New York), White_Line Editions (UK) and Leerraum (Switzerland). This is the first gallery exhibition of Graydon’s work in the DC area. In his Data/Fields sculptural video installation, Untitled (band pass Arlington), a single white line of video light moves slowly over a pile of stones and debris. It is unclear to the viewer whether the pile is made from the raw materials for future building, or if it is the remains of a demolition or a structure’s decay. Across this, the white line of light cuts a kind of index mark, a way of traversing the material’s topography in time. The line of light operates dually, at once ‘playing’ the rough material texture and form that it glides across (as if it were the long white cursor ubiquitous in audio software interfaces), while simultaneously being deformed by that very material’s texture and form. This dual functioning of the line reflects upon the material it describes: if the line is a cursor, the pile becomes the elements of a composition-in-process, while if the light forms a line of topography, the pile is its field, its given environment. The work finds its balance, its simulation of data collection and visualization, in this space of oscillation between composition and environmental art-as if scanning data of the past while reforming some future. Japan’s leading electronic composer RYOJI IKEDA (b. 1966) focuses on the minutiae of ultrasonics, frequencies and the essential characteristics of sound itself. His work exploits sound’s physical property, its causality with human perception, and mathematical dianoia as music, time and space. Using computer and digital technology to the utmost limit, Ikeda has been developing particular ‘microscopic’ methods for sound engineering and composition. Since 1995 he has been intensely active in sound art through concerts, installations and recordings: the albums +/- (1996), 0 degrees (1998) and Matrix (2000) have been hailed by critics as the most radical and innovative examples of contemporary electronic music. With Carsten Nicolai, he works the collaborative project ‘cyclo.’, which examines error structures and repetitive loops in software and computer programmed music, with audiovisual modules for real time sound visualization. The versatile range of his research is also demonstrated by the collaborations with choreographer William Forsythe/Frankfurt Ballet, contemporary artist Hiroshi Sugimoto, architect Toyo Ito and artist collective Dumb Type, among others. Ryoji Ikeda received the Golden Nica prize at Prix Ars Electronica 2001 in the Digital Music category. This is the first gallery exhibition of Ikeda’s work in the DC area. Part of Data/Fields, his audiovisual installation data.scan is composed from a combination of pure mathematics and the vast sea of data present in the world. Each single pixel of the visual image is strictly calculated by mathematical principle. Visitors to the exhibition will experience the vast universe of data in the infinite between 0 and 1.Commissioned by Surrey Art Gallery and co-produced by Forma, data.scan was programmed by Tomonaga Tokuyama. FRANCE JOBIN (b. 1958) is a sound/installation/web artist residing in Montreal, Canada. Her audio art can be qualified as ‘sound-sculpture.’ It reveals complex sound environments where analog and digital meet. Her installation/web art can be said to follow a parallel path, incorporating both musical and visual elements. Jobin has created solo recordings for bake/staalplaat (Netherlands), ROOM40 (Australia), nvo (Austria), DER (USA) and ATAK(Japan). Her work appears on countless compilations. She collaborates with Tomas Phillips (sound artist) and Cédrick Eymenier (visual artist). Jobin’s installations as well as live performances can be ‘experienced’ in various music venues and new technology festivals across Canada, the United States, South America and Europe. She is currently curating the concert event/philosophy immersound. Her work continues to evolve as technologies enable her to create in new environments. Data/Fields is the first gallery exhibition of Jobin’s installations in the U.S. Created entirely with actual field recordings from across the globe and on location around Artisphere for Data/Fields, Jobin’s site-specific work Entre-deux explores acts of systemic, yet subjective, information gathering. Spaces and times are chosen for their inherent beauty, then processed and reformed as location and experience itself becomes transposed. Entre-deux is the re-placing of data.